Many people believe aliens live among humans on earth, and there are specific ways you can identify them. You can learn how to detect reptilians and other obvious aliens, such as the Men In Black (MIB), tall whites, and the Nordics. There are others said to have hypnotic abilities or technology that allows them to camouflage themselves as humans. Obviously, any alien disguised as a human would need to be fairly human looking. Certainly one of the greys or reptilians would be too easy to spot in a crowd at the mall. However, in the ufology culture there are said to be many humanoid types of aliens. In fact, some people claim they can tell a camouflaged alien posing as a human. They have defined specific, telltale signs that make these non-humans stand out. The Men in Black (MIB) have been reported for decades and appear soon after a sighting or an encounter with a UFO. Who or what they are is often debated. Some believe they are a type of android, while others think they are robots. Whatever they are, the MIB are said to be fairly uniform in appearance and once you encounter one, you certainly will know it and why they are so different from a normal human being. They have no facial hair, are very pale, appear to be bald, and sometimes wear wigs. They have very large, blue eyes (they often wear sunglasses). They wear long, black trench coats, a black suit, white shirt, narrow black tie, and a black Fedora hat. They appear emotionless and talk in a monotone or robotic manner. The pros and cons of attempting to identify MIB is tricky since few photos or video evidence exist. However, the rare video above certainly gives credence to many of the past and present claims of MIB visitations. The men in the video fit the eyewitness descriptions. Those claiming to have been visited by MIB believe the men were possibly robotic or even cloned beings. Based on their testimonies, it could be plausible that the MIB are something other than human. In March 2016, Express reported Pleiadians were cropping up all over the internet. Claiming to be aliens living among humans, the Pleiadians, also known as the Nordic-looking alien race, were reaching out to humans. They want to assist humans in transforming to the next level of existence. Blogger Scott C. Waring states the Pleiadians, "Come from the stellar systems surrounding the Pleiades stars." Some believe Scandinavians and Native Americans are Pleiadian descendants. The Nordics supposedly hail from Erra, a planet orbiting the star 10-Tauri or Taygeta. The Pleiadian legend places the race as descendants of yet another alien race originating from the planet Lyra, located in a galaxy beyond the Milky Way. The Nordics are described as those of Viking descent but trying to identify them may be very problematic and even embarrassing. Many people living in Norway, Denmark, Finland, Sweden, or Iceland could have all of these traits. It seems risky, and the only way to identify a Nordic alien would be to have one introduce themselves as such or through an abduction scenario. Below is a Peter Khoury interview about Tall White visitation and subsequent DNA evidence. It starts at 38:40 in the video. The Tall Whites are a type of alien with very little information given about the species. They are said to be tall, white, and very enthusiastic about Earth culture. It's believed that older Tall Whites can reach 10 feet tall, while younger ones can blend in with a shorter height. The Torontoist quotes UFO specialist Chris Russak saying most people have probably seen Tall Whites and not been aware they were seeing aliens. Psychic channeler Charlie Kundallini revealed Tall Whites love Las Vegas, and you will often see them in the casinos, conferences, and theaters there. The story doesn't say why so many Tall Whites are drawn to Vegas, however. A different side of this tall tale is the January 2014 Forbes article, Iran Says 'Tall, White' Space Aliens Control America. The article cites a FARS News Agency report based on supposed documents that NSA whistleblower Edward Snowden leaked. The documents supposedly identify the Tall Whites as an alien race that is the real ruling government of the US, and the same one that aided Nazi Germany. What happens in Vegas stays in Vegas might be very true of Tall Whites, according to eyewitness reports. Attempting to identify anyone as a Tall White alien simply based on height and overall appearance would be risky. There are many white humans who are tall although these aliens are said to have very light skin, and their hair is equally white. A person could dye his hair and stay out of the sun and possibly pass for such a description. Unless you have an encounter with DNA evidence, such as Peter Khoury in the above video, there's little chance you could prove or identify someone as a Tall White alien by merely looking at him. Wondering how to spot a reptilian? Reptilians are described as having a lizard-like appearance. It's believed they are able to shape shift due to their unique molecular makeup. It's also believed they have some form of technology, similar to a hologram, that further aids them in being able to take on any shape they desire. For this race, the earth is an outpost. Their mission is to dominate and control Earth since their planet is dying. It seems impractical to be able to identify someone as a Reptilian based on webbed feet, since some humans have this characteristic, as well as skin rashes, keen hearing/eyesight, and sensitivity to cold/hot temperatures. You might be able to suspect a Reptilian alien if you saw a forked tongue, but some humans have undergone tongue splitting surgery for personal reasons. Since Reptilians supposedly have the ability to shape shift, it seems very unlikely you would be able to identify them unless you witnessed them morphing in shape. Being an eyewitness to such a transformation would certainly allow for such identification, that is until the Reptilian shape shifted into yet another form. 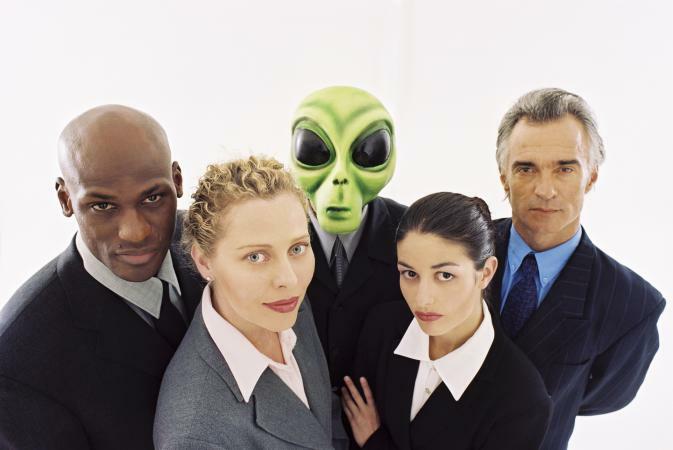 In April 2015, International Business Times reported that a former Canadian defense minister, Paul Hellyer (1963-1967), publically declared aliens are on Earth, and world leaders are covering it up. Citing the New World Order and that its cabal are behind the cover-up, Hellyer called for full disclosure by world governments. The big reveal would put to rest once and for all the question if aliens are real. Hellyer stated that aliens have been on this planet for thousands of years. This wasn't the first time Hellyer made public statements about his belief in aliens. In 2005, he asked the Canadian government to hold public hearings on ETs (extraterrestrials). In addition to this request, Hellyer accused the US of being in the process of planning an intergalactic war. Later, Hellyer told Russia Today there are 80 different ET species visiting or living on Earth, and some look very human. Many native peoples have stories of alien visitations handed down generation after generation. Some people believe aliens are currently living here that have been on Earth for thousands of years. If you were to come upon someone you believed to be an alien, what would you do?